First, I'm so happy to report that month 3 of my #6MonthsWithoutShopping challenge is done, and I've bought nothing. Still sticking to my challenge. I did buy a hair curler but as beauty and makeup/skincare products are exempt I'm not counting that. The hardest temptation for me this month was a mustard yellow cardigan in my size for $2 in an opshop. I've been wearing a lot of mustard lately with my little mustard Rebecca Minkoff micro Regan bag so have been wanting more of it. But I left it behind. Even though I keep thinking about it! Now, what I've been wearing. One colour combination I'll always come back to is blue and pink. Neon, pastels or any shade in-between, I just love the colours together. The outfits below are really simple with denim shorts and basic tees. Adding a bright handbag and printed kimono creates a little more interest and makes the outfits less plain. Kimonos are a perfect completer pieces for an outfit, even in hot weather. This was an easy outfit for playgroup, and then a quick stop at the post office in the afternoon to mail some more ebay parcels. Shorts and a tee is a great warm weather playgroup outfit, and it's what the boys wore too. Adding the printed kimono and bright bag made my outfit a little more colourful and fun. Although the kimono has red in the print instead of pink, I really liked the neon against the navy background. Just like last time I paired the two together. Cooper wasn't in the mood for photos this morning and tried to hide away - you can see him peeking out in my instgram photo too. Last worn: printed kimono, black tee, bermuda denim shorts, studded sandals, neon pink mini MAC bag. Other ways to wear: printed kimono worn two ways, black tee and printed jeans, bermuda denim shorts and button up shirt, studded sandals and printed shorts, neon pink bag and olive tank. Same outfit formula as the first outfit - blue kimono, basic tee and denim shorts with a bright pink bag. I had picked the bag and kimono first, then the shorts and wasn't sure what top to choose. Went with this neutral grey tee as it's been a while since I last wore it, 7 months! Despite getting rid of a lot of grey tees I obviously still have a long way to go if it's so long between wears. It was such a hot day I wished I'd picked something with a little less fabric, like a tank instead of this tee. We spent the day northside visiting the emergency services expo. Although much too hot for us to enjoy walking around an unshaded park, Toddler T and Baby Boy had a fun time jumping up on all the fire engines and police cars and ambulances. Last worn: printed kimono, grey v-neck tee, denim shorts, Havaianas, neon pink mini MAC bag (above). Other ways to wear: printed kimono and graphic tee, grey v-neck tee and printed pencil skirt, denim shorts and printed tank, neon pink mini MAC bag and black skinny jeans. Add more colour to a basic shorts and tee outfit with colourful accessories like handbags and kimonos. A plain neutral tee is a great base for a bright bag and printed kimono as you don't have to worry about mixing in any more colours. Linking up with The Ultimate Rabbit Hole, Budgeting Bloggers, Shoe & Tell. I don't think I could have resisted the mustard yellow cardigan if it was only $2! I would have pretended it didn't count. Ha ha. I'm only on day 8 of no shopping at the moment and I'm already feeling anxious! 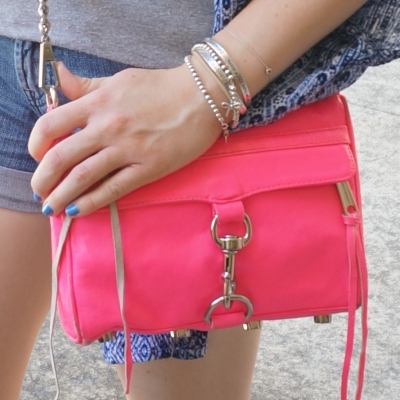 Love your pink bag, the neon is stunning! haha yes I did briefly try to consider how I could buy it and still meet my goal! Good luck with your challenge! I like your sandals in the first outfit, so unique and nice. 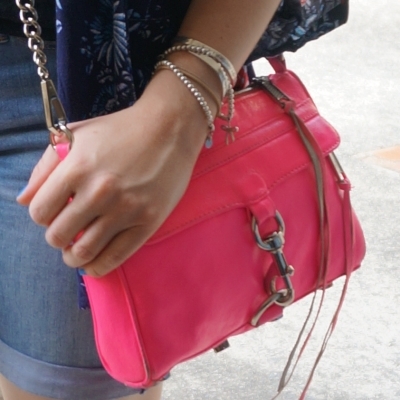 This bright pink bag looks super cute. I like the kimonos on you . I've been trying to cut back on shopping too, and it's NOT easy! It sounds like you're doing a great job though! It's definitely not easy changing such an established habit! Such strength of character in resisting the cardigan. Well done! haha yes it took willpower for a shopaholic like me! Wow! I don't think I could do 6 months of no shopping! Good for you! That bright pink bag is so fun! Yep 3 months down, I'm hoping I last the whole 6! Oh you're so good not buying the cardi, for 2 dollars I know I wouldn't have been able to resist! That pink bag really adds a pop of colour to your outfit and I'm loving that blue and pink combo. It was so hard to pass up the bargain! You have made a wonderful challenge and look at you! it's going really well too. Not everyone thinks of the blue and pink combo and you make it rock. I love this color combo--the bright pink is so pretty against the blue. Way to go for continuing your no shopping challenge!! I'm so impressed with your willpower to walk away from an awesome deal like that cardigan. I'm surprised at myself too! And hoping it will still be there when the ban is over although I know it won't, haha! The hot pink mini MAC is awesome! Love the outfits, you always look so chic in cardis. Oh my goodness girl! like this outfit is waaaay cute - love the pink bag! I always love your fashion! The necklace is so cute! congrats on 3 months without shopping challenge. That's so impressive that you were able to resist a $2 cardigan! If I like something and it's $5 or less, it's usually coming home with me, haha! Yes, it's hard to pass up deals like that! The pink Rebecca Minkoff bag is great! I love the color and shape! I wasn't sticking to my list so decided a break was needed! Well done on the no purchases. I'm three months in too and hoping to make the year. We will keep strong together. Your kimono/bright bag/jean shorts combo really works so well together. I am so impressed you are holding strong with no purchases! Wow I take my hat off to you for resisting that mustard yellow cardi for $2, that must have been tough! ;) Your commitment to the challenge is amazing, dear. I like both outfits you're wearing here, very comfortable, practical and with a lovely color scheme. Your sandals on the first outfit are lovely, too! haha it was - I'm still thinking of it! I love your red bag...looks so cute with your outfit! Yay ! on your 3 months Mica !!! I gave myself a small budget at a thrift store this weekend, like a break from it all. But most likely I will go back as I did not accomplish what I set to do, which was to take control of my closet. I look forward to seeing what you bought this month :) Well done for completing your 3 month! I did consider it! I stood there trying to find ways I could buy it and still meet my challenge, but in the end knew it would be cheating so walked away. I want a kimono so badly!! I love what a versatile piece they are!! It's still really cold in the mornings to make the transition from cardigan to kimono just yet, but oh man am I so ready! I've added so many cute ones over the last few months and I can't wait to live in them all summer long!